Interested in advertising with The American Legion? Please contact us. 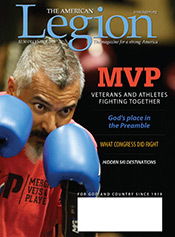 Mass Reach: The American Legion Magazine, a monthly publication that reaches 1.8 million members, is consistently ranked No. 1 "best read" among nearly 200 publications by an independent auditor. It is a general interest publication which concentrates on world events and national news analysis. Monthly columns include health, current events in Washington, D.C., veterans affairs and current issues. 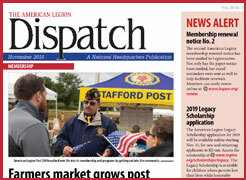 Legion Leaders: A full-color newsletter, The American Legion Dispatch, is published monthly to keep local, state and national leaders of the organization informed on a variety of issues including legislative updates, internal campaigns and membership initiatives. Circulation is 15,500. 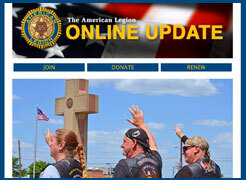 The American Legion's website is a dynamic electronic window to the nation's largest wartime veterans organization. Frequently updated news stories, videos and photos present visitors with a rich assortment of information about the Legion and its many programs. 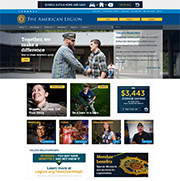 A weekly e-newsletter, The American Legion Online Update is sent to more than 970,000 individuals who are interested in the top stories, videos and photo galleries within the Legion's electronic portfolio. High-priority news on veterans benefits, the GI Bill, patriotic activities, wounded warriors and Capitol Hill are inter-woven with human-interest pieces and interviews with leading national figures. Our Convention Program is distributed to each of our delegates when they convene at our National Convention in a predetermined U.S. city at the end of August each year. 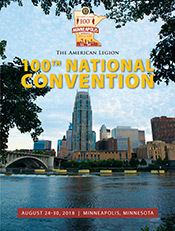 The program contains meeting schedules and maps of the convention center, and other useful information. The Convention Program also gives a brief introduction to the city, which provides an excellent opportunity for local attractions to advertise to our captive audience. For more information about advertising in The American Legion Convention Program please contact: Chris Elliot - celliot@legion.org. If you would also like to participate with a face-to-face experience with The American Legion Family with a booth in the Exhibit Hall at convention, please contact Bridget Robinson, (317) 630-1292.